After months of anticipation, U.S. Citizenship and Immigration Services announced on July 29, 2016 a final rule to expand the I-601A Provisional Waiver process. The I-601A Provisional Unlawful Presence Waiver was created in 2013 in an effort to reduce the time that family members are separated during immigrant visa processing. Prior to the current expansion, only spouses, parents, and children of U.S. citizens who could demonstrate extreme hardship to a U.S. citizen spouse or parent could apply for the provisional waiver. Now, all intending immigrants who are statutorily eligible for an I-601A Unlawful Presence Waiver can apply starting August 29, 2016. 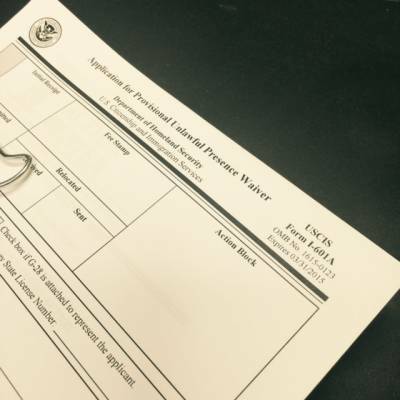 In general, individuals who are not eligible to adjust their status within the United States must travel abroad and obtain an immigrant visa – a procedure called “consular processing.” Intending immigrants who have accrued more than 180 days of unlawful presence while in the U.S. must first obtain what is called a “waiver of inadmissibility” to overcome the unlawful presence bars before they can return to the U.S., based on the extreme hardship their U.S. citizen or permanent resident spouses or parents would suffer if the waiver were not granted. In the past, no one could apply for a waiver until after appearing for their immigrant visa interview abroad, and a consular officer determined that a waiver was needed. This often created a delay of several months or even years where the intending immigrant was separated from his or her U.S. citizen or permanent resident family member while waiting for the waiver to be processed abroad. The expanded provisional unlawful presence waiver process allows family-based and employment-based immigrant visa applicants who will need a waiver of inadmissibility only for unlawful presence to apply for an I-601A Waiver from within in the United States before they depart for their immigrant visa interview abroad, as long as they can demonstrate extreme hardship to a U.S. citizen or permanent resident spouse. This expansion is a welcome step to promote family unity and lessen the hardships on American families during the immigration process. The expanded I-601A process goes into effect on August 29, 2016 – applications can be submitted on or after that date. Please contact Kolko & Associates, P.C. for more information about the I-601A Provisional Waiver expansion.